Tacloban City―The provincial government of Eastern Samar continues to develop a tour program for its various tourist attractions and destinations. Provincial Tourism Officer Franklin Robedizo said they are pushing for the Balangiga Historical Tour on Balangiga for pilgrimage tourism. Another is the “Tubabao Island Dobrota Tor” to welcome Russian tourists during this year’s 70th commemoration of the odyssey of “White Russians” to Tubabao Island in Guiuan. Also, Eastern Samar is pushing for the nomination of Samar Island Natural Park, the country’s largest forest protected area, to the UNESCO world heritage site and biosphere reserve. Robedizo acknowledged the efforts of the Department of Tourism in Eastern Visayas for assisting them in the development of their tour program. 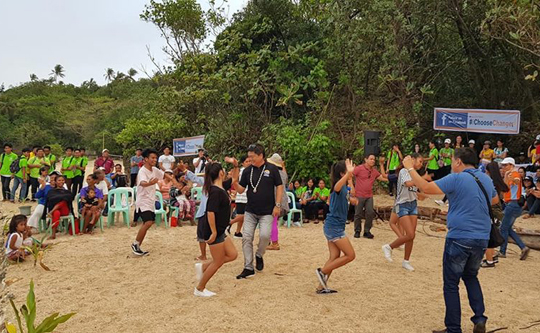 The tourism officer also announced the launching of Eastern Samar Kuracha Mardi Gras 2019 by Picardal at the campsite themed Hilangagan Beach, Punta Maria, Borongan City. “The tourism officers of Eastern Samar are also very active. They organized the Eastern Samar Tourism Officers Association. They regularly meet and conduct joint activities like site assessments and product audits,” said Karen Tiopes, the DOT regional tourism director. “It has actually placed Balangiga in the tourism map,” Tiopes said. Since its return till the end of January, the town received 22,000 visitors, she added. With the influx of tourists, DOT is conducting an assessment of the existing tour in Balangiga and identified the gaps. “We now have a list of things that will be done within three months and tasks that will be completed in six months or more,” she said. Meanwhile, Tiopes said that DOT has accredited 16 “homestay” places in Divinubo, Borongan and two in Hernani in the province. “DOT assessed all these homes to determine if they meet the homestay standards and we trained the owners of these houses,” Tiopes said. “For Balangiga, we have yet to assess the homes of those that the local government unit has identified for homestay. This will be part of the medium term ‘To Dos’ for Balangiga. Priority projects will be training for the stakeholders and frontliners to make the Balangiga Historical Tour market- and visitor-ready,” added the tourism director. According to Tiopes, many LGUs also have tourism initiatives already. Some are beneficiaries of the Yolanda Recovery and Rehabilitation Program tourism infrastructure and livelihood project, she said. Eastern Samar posted 80,715 tourists where 294 were foreigners and 80,421 were domestic, based on the DOT regional office’s records on total same day-visitors for 2017. The region had a total of 3,879,849 visitors in 2017 with tourist receipts of P13. 97 billion. DOT in the region has yet to issue the complete list of tourist arrivals in 2018.